technology used is at the medically highest level. It is based on the respiratory gas measurement and is preferred by professional athletes to maximize performance. Now you and your customers can benefit from a competitive edge through effective training! 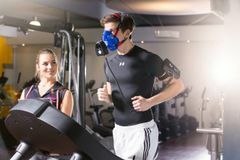 Using a closed breathing mask, DYNOSTICS records the entire respiratory gas flow and continuously analyzes the concentrations of oxygen and carbon dioxide in the inhaled and exhaled air in a highly precise manner – small and compact directly on the mask thanks to the latest technology. This development sets DYNOSTICS apart from other providers. DYNOSTICS provides a sensible solution that represents a significant added value for both the gym and personal trainers , as well as for the Member or the athlete : In addition to analyzing the precise , individual pulse are on site at the gym an app part of the scope . We measure O2 and CO2 from each breath and calculate the RQ automatically 4x per second. After the measurement, these raw data (CO2, O2, RQ, VO2max etc.) are calculated with the ambient air on the basis of the calibration and compensated by the temperature, pressure, and humidity. Afterwards, we have values ​​at medical level, which are automatically evaluated by the app. Our unique innovation is to perform an automatic evaluation of the spiroergometry by means of highly complex algorithms developed with 6 big performance diagnostic centers. Here we include among others: the RQ-value, the VO2max, Breath equivalent, Lactate etc.! Lactate can only be determined by blood, but through our diagnostic center we have more than 20,000 customers with lactate and spiro values, so that we could develop an algorithm, which we also include. 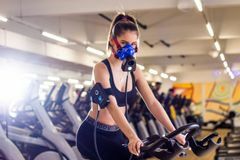 This results in a very high percentage of our automated evaluation as a diagnostic center that determines the thresholds based on lactate and respiratory gases. You can rely on our system, every breath is measured and very elaborately evaluated. After the automatic evaluation is done, you can use the automated training planning of DYNOSTICS. The values ​​of VO2max and the individual anaerobic threshold are among the factors influencing the training plan so that the training plan is always tailored to the patient's breathing gas values. As a result a personalized training plan (with the company name and logo of the gym or personal trainer) can be automatically printed out as a PDF or sent to the subjects by mail, enabling him to train individually with Pulse values ​​that correspond exactly to his current fitness level and his training goal fit. DYNOSTICS is therefore a system with state-of-the-art technology with an individual automatic evaluation, which means, that all gyms or trainers can offer their members / athletes a performance analysis on the medical level, even without knowledge of sports science. By the way, the sensors automatically calibrate by means of the ambient air. 2.What are the expendables which we need to replace , the number of tests after which we need to replace expendables and their cost for example O2 cells, sensors, tubings etc.? The turbines must be replaced. We have single-use turbines, multiple-use turbines and permanent turbines. These cost between 1.50 euros, 25 euros and the permanent 200 euros. The sensors do not have to be replaced, they are maintenance-free. 3.Do we need to calibrate the machine before each use and if so how is this done? We have a easy self calibration before each test. 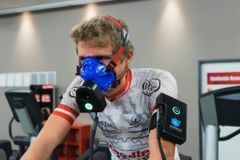 4.Does the spiroergometry give the lactate threshold versus Heart rate lactate threshold versus Respiratory quotient,Resting metabolic rate.Could we get some more inputs on what outputs do we get besides VO2 max. These questions have already been clarified above, a VO2Max is not displayed in this version. 5.Instead of an app can we take a printout report and give it to the client or is it mandatory to purchase/ subscribe to the app. (this might be a negative for the Indian client if they need to purchase/ subscribe to an app and to understand it also a lot use android applications and a lot do not exercise with their phones). Yes, the results can also be printed. Customers can still get the results via the free app.